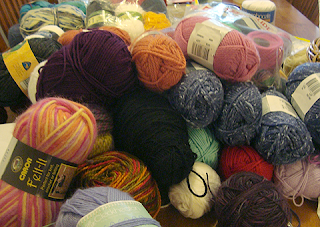 This isn't too much yarn. Honest. 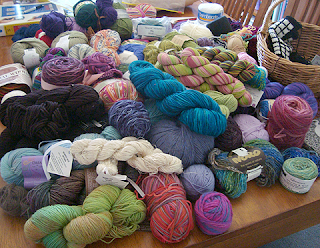 But maybe it is time to reorganise it ... the Annual Stash Review. It's taken several days. I've updated my stash on Ravelry, but thought it would be kind of nice to have a written record as well, hence the notebook and pen. Scales were employed, remaining yardages (metreages, whatever) were calculated, maths was used. Miss Petal even helped to wind unruly balls of yarn into tidy balls (not that she ever contributes to the existence of unruly balls, no, never. Would this puppy lie to you?). This is what my leg looks like now. Staples are out, dressing is off for good, it's all healing well. The vertical thick scars are from my multiple CDH childhood surgeries. 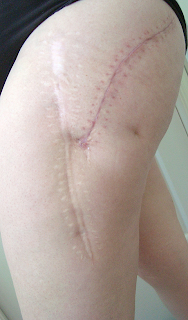 The redder angled scar is from the top hip replacement (posterior approach), 6 weeks ago. A nice narrow scar, much neater than what they did to me in the 1960s and 70s! I'm allowed back on the road now, had my first little drive in nearly 2 months yesterday - it's great to feel some independence returning! My physio exercises are progressing to standing exercises, rather than lying down. And I can walk around without crutches or a walking stick. I take short steps, and go slowly, but no walking aids, yay! When I'm out shopping I still use a stick, just in case, but I'm enjoying not needing assistance at home. There are still challenges - my obturator nerve is still stuffed, although it is making slow progress, and I'm still on pain meds. I still get tired pretty quickly, am sometimes getting cramps in my thigh and knee, and keeping to the 90º rule is difficult at times. I'm still on Warfarin and have to wear the DVT stockings in this summer heat. But on the whole, things are definitely looking up! Wishing you and yours a very happy New Year - here's to a great year ahead in 2010!! It's great to start the new year all organised...I wish I could say that I was doing that, but I'm afraid not! Glad things are going well with the leg - driving - woo hoo! Good hip news, it must have been awful not being able to drive, I mean apart fro all the other painful things!! 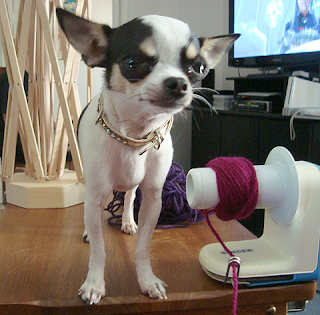 Miss Petal is an excellent inspector and I cannot believe she would even make unruly balls of wool!! Nice stash. The leg is looking good, as is the chest (and hamper and basket). Hope the pain eases really soon, and you can get back to playing happily with all that smooshy goodness. The puzzler in you must have had a ball, bringing order to chaos and noting it all down. 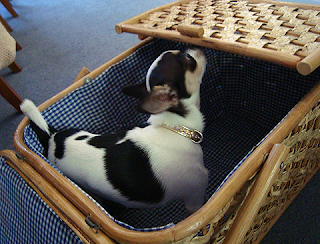 The chest, basket and hamper are works of art! I believe, if there were treats involved, that puppy would lie like a throw rug. You have a trim and shapely hip there, Missy. Hooray for healing and independence!!! A) Stash - looks like a store! B) Hip - healing nicely! Yey! Yay! Noticeable progress on the road to wellness! Hope 2010 is a fabulous year! Mmm! 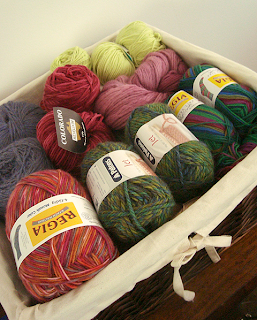 I am jealous of all of your yarn :) It's nice to see someone more organized than I am! Happy New Year! Well done on the airing of the stash! Glad to hear that you are getting better! 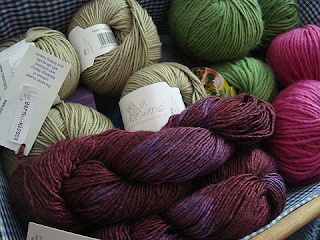 ooh I love a good stash review. Or, as Brenda Dayne calls it, the Airing of the Stash. I think I need to do this! So glad you're out and about again! What a pretty stash! Lucky it's, um, far away and safe from me. Glad to hear you are progressing. I live where there's no public transportation to speak of - I'd be cut off if I couldn't drive. I organized my closet and now my clothes are all neat and together. 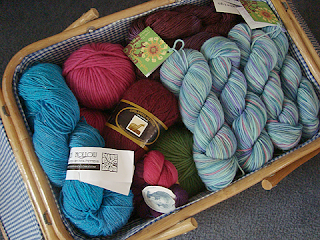 I don't have much stash, except for some sock yarn so that's not too much of a problem. I do like to take it out and look at it and see what I have when the temptation to buy more hits. I'm so glad to see how well you're healing! The scar looks good and you're walking! Without aids! Hurrah for your first steps to freedom. It's so good to hear that your body is healing nicely. As for your stash, good job and good idea. I think that all our stashes could use a good airing out. I'm so glad to hear that you're healing well and gaining mobility and independence. 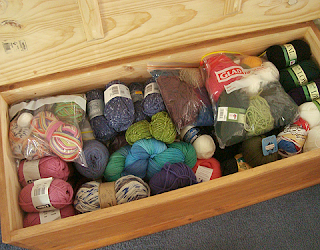 The stash looks beautiful and organised. Mine really does not look like that. Oh well. Happy New Year to you and of course Miss Petal too! So pleased to read you are mending well. All best wishes for a continued speedy and mobile recovery. I'm so happy to hear that you're feeling better and getting out and about a little bit. The leg is looking pretty good! Congratulations on getting your stash organized. Would you be up for organizing mine, too? Glad about the hip news. 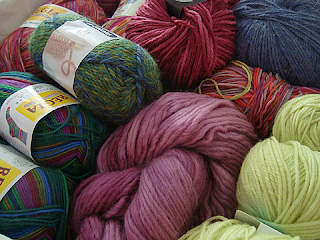 As to the yarn, yee gods! 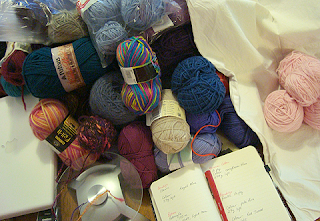 I mean, oh how good to have a hobby that can be organized, and have such nice colours.